At Cracker Barrel we all have our Cracker Barrel menu favorite items. I personally love this restaurant, it reminds me of dining at my Great Grandmothers house. You are surrounded by lovely antiques then you get to treat yourself to a wonderfully cooked home-style menu. Here are 17 of my Cracker Barrel menu favorite items. I can’t think of a better place I enjoy stopping at when I travel. They have one of the most delicious breakfast you can get out on the road. They serve a breakfast like you wished you would make at home. Truth be told, I hate to cook breakfast at home. First off, I am not really a morning person. I do good to let the dog out, and make a cup of coffee, and eventually speech forms, which is often about 30 minutes after getting out of bed. To me cooking a meal first thing in the morning is inconceivable. So when I am out on the road this type of sit down breakfast is exactly what I am looking for. Another one of the reasons I really love the Cracker Barrel menu is because they often have seasonal favorites. They have a great knack of adding menu items like the pumpkin custard during the holidays or even their chocolate pecan pie is a holiday favorite. So you know that you can always try something new when you go to the Cracker Barrel. 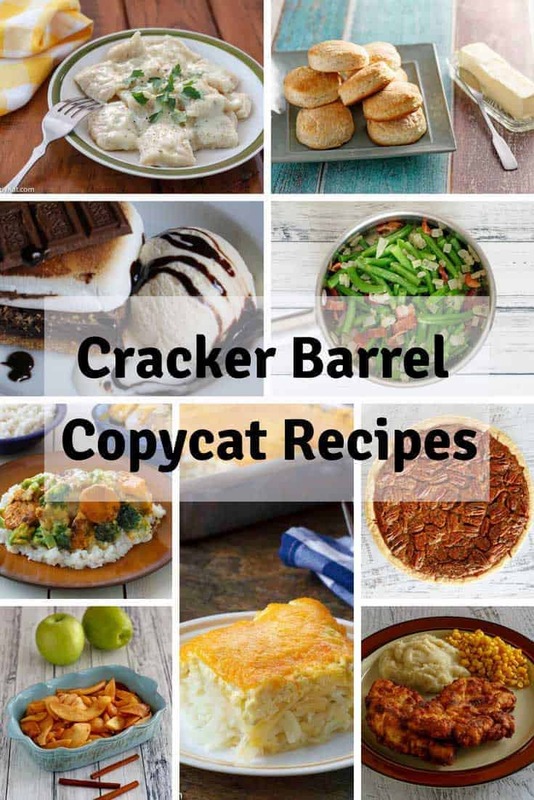 I hope you give some of these recipes a try. Here are some of my Cracker Barrel menu items I just love. I hope you enjoy many of these as well. I would love to find a recipe for Cracker Barrel spiced apple tea. Unfortunately it is only available at their restaurant from November through the end of December. I thought how hard could it be to replicate it so I’ve tried but failed. It’s all in the spices but I just can not get it right. Thank you for your suggestion. I will have to try to duplicate it next year. I would love the recipe for their chicken noodle soup. Stopped in there whilst on holiday and had the soup and a grilled cheese, best meal of my holiday. Bit of a long trek from the uk tho to go back for it again so being able to make it at home would be amazing! My family ate at Cracker Barrel tonight and I had the apple cider chicken for the first time and loved it! Have you ever tried making it? I am going to attempt it soon, the apple cranberry chutney that it comes with is also delicious! Thank you for your comment, I will have to give it a try sometime. I have not tried making that before, I will have to check it out. How does Cracker Barrel season their broccoli? I recently had the 3 Cheese Grilled Cheese Sandwich and would love to make this version at home. It was so good!! I stop everytime I’m around one of your restaurants, which are far away from Los Angeles. I’m very interested in what the use instead of salt. It would really be of help if I knew or purchase some. I would love to have the recipe for cracker barrel dumplings. I love them. Hi, have you added the Chicken and Rice recipe from Cracker Barrel? Soooo need the Cracker Barrel recipe for CHICKEN and RICE..plz…. I would love to get cracker barrel recipe for there apple butter that they serve there. Have you tried their campfire meals? Would like to know what seasonings they use?